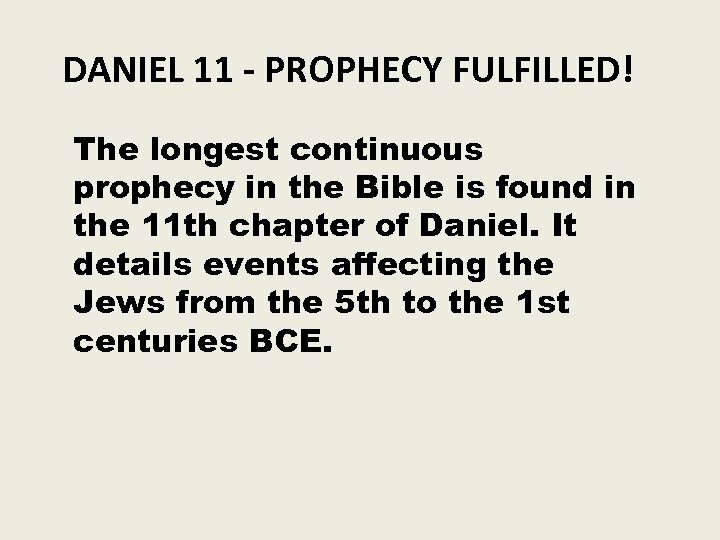 DANIEL 11 - PROPHECY FULFILLED! The longest continuous prophecy in the Bible is found in the 11 th chapter of Daniel. It details events affecting the Jews from the 5 th to the 1 st centuries BCE. 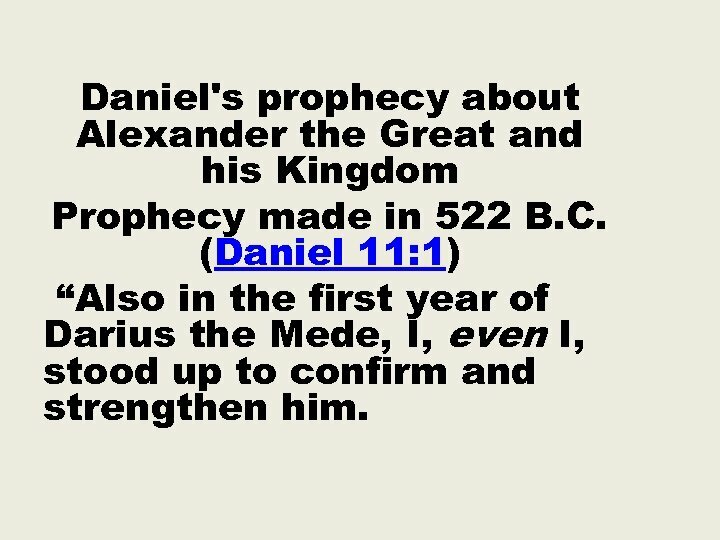 Daniel's prophecy about Alexander the Great and his Kingdom Prophecy made in 522 B. C. (Daniel 11: 1) “Also in the first year of Darius the Mede, I, even I, stood up to confirm and strengthen him. Dan 11: 2 “And now I will tell you the truth: Behold, three more kings will arise in Persia, and the fourth shall be far richer than them all; by his strength, through his riches, he shall stir up all against the realm of Greece. The fourth King of Persia will be rich and strong Persian Kings are: 1. Cyrus the Great reigned from 560 to 530 B. C. 2. Cambyses II reigned from 530 to 522 B. C. 3. Darius Hystaspes reigned from 522 to 486 B. C 4. 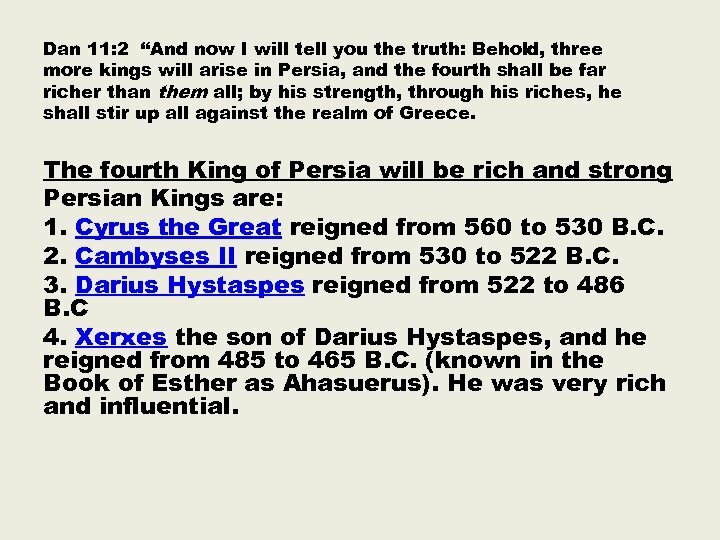 Xerxes the son of Darius Hystaspes, and he reigned from 485 to 465 B. C. (known in the Book of Esther as Ahasuerus). He was very rich and influential. Dan 11: 3 “Then a mighty king shall arise, who shall rule with great dominion, and do according to his will. 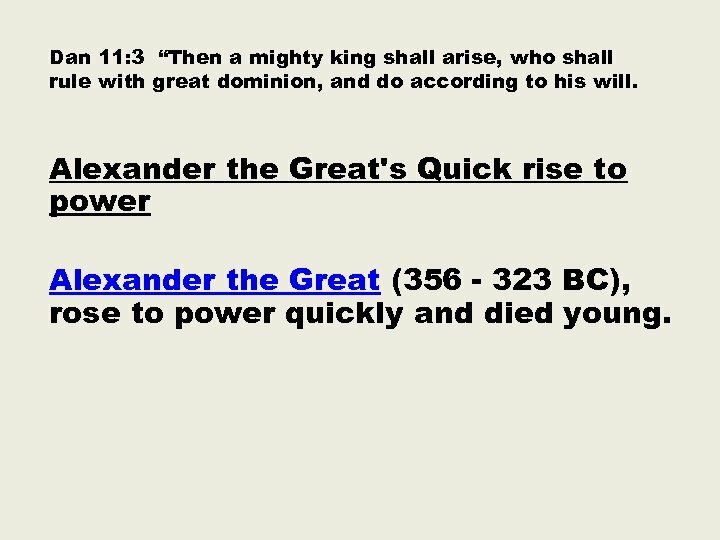 Alexander the Great's Quick rise to power Alexander the Great (356 - 323 BC), rose to power quickly and died young. Dan 11: 4 “And when he has arisen, his kingdom shall be broken up and divided toward the four winds of heaven, but not among his posterity nor according to his dominion with which he ruled; for his kingdom shall be uprooted, even for others besides these. 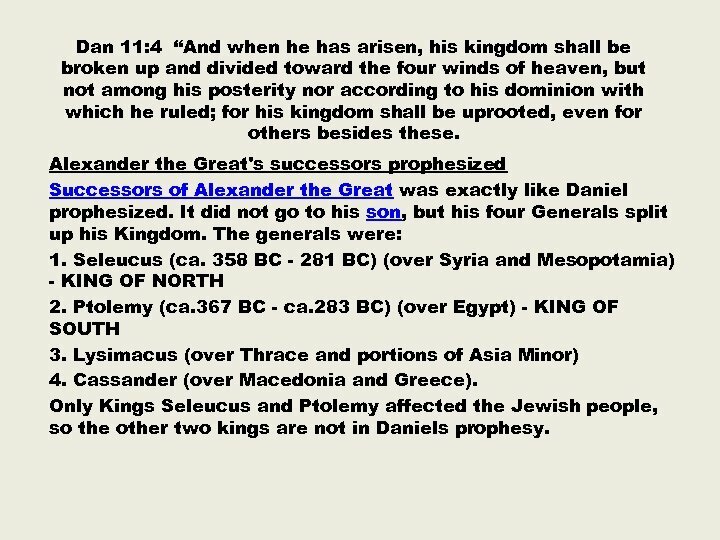 Alexander the Great's successors prophesized Successors of Alexander the Great was exactly like Daniel prophesized. It did not go to his son, but his four Generals split up his Kingdom. The generals were: 1. Seleucus (ca. 358 BC - 281 BC) (over Syria and Mesopotamia) - KING OF NORTH 2. Ptolemy (ca. 367 BC - ca. 283 BC) (over Egypt) - KING OF SOUTH 3. Lysimacus (over Thrace and portions of Asia Minor) 4. Cassander (over Macedonia and Greece). 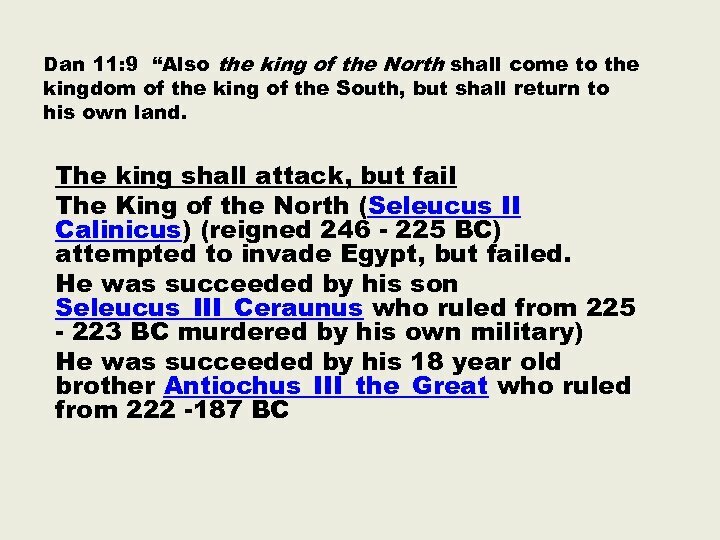 Only Kings Seleucus and Ptolemy affected the Jewish people, so the other two kings are not in Daniels prophesy. Dan 11: 5 “Also the king of the South shall become strong, as well as one of his princes; and he shall gain power over him and have dominion. His dominion shall be a great dominion. 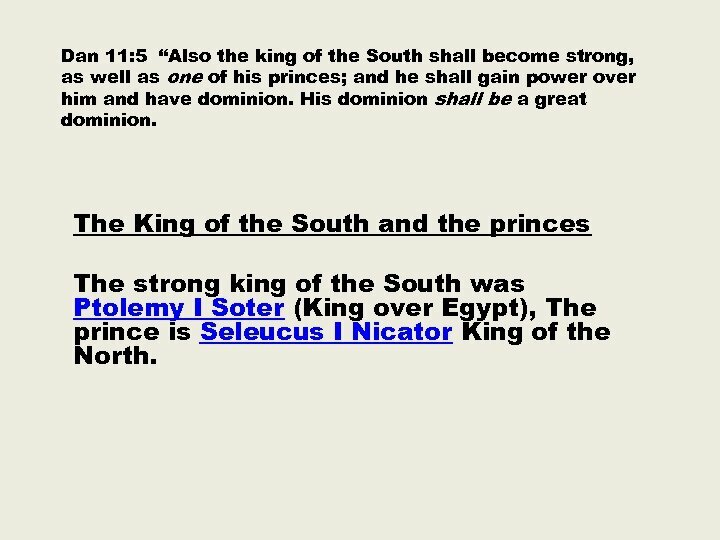 The King of the South and the princes The strong king of the South was Ptolemy I Soter (King over Egypt), The prince is Seleucus I Nicator King of the North. Dan 11: 6 “And at the end of some years they shall join forces, for the daughter of the king of the South shall go to the king of the North to make an agreement; but she shall not retain the power of her authority, and neither he nor his authority shall stand; but she shall be given up, with those who brought her, and with him who begot her, and with him who strengthened her in those times. 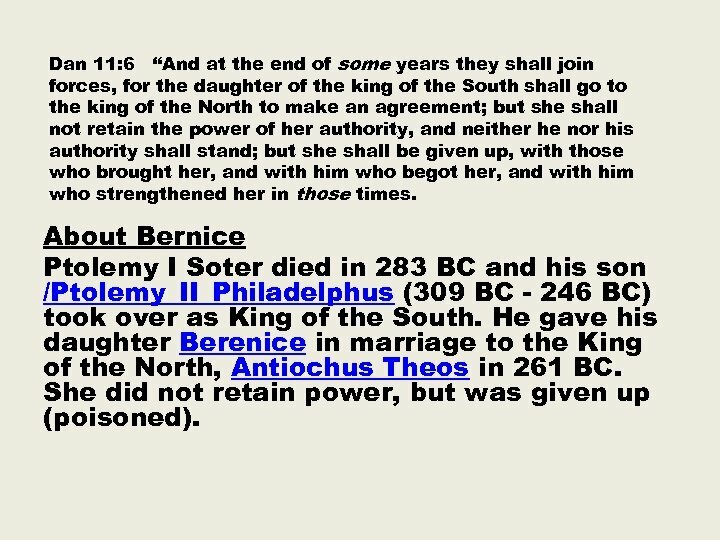 About Bernice Ptolemy I Soter died in 283 BC and his son /Ptolemy_II_Philadelphus (309 BC - 246 BC) took over as King of the South. He gave his daughter Berenice in marriage to the King of the North, Antiochus Theos in 261 BC. She did not retain power, but was given up (poisoned). Dan 11: 8 “And he shall also carry their gods captive to Egypt, with their princes and their precious articles of silver and gold; and he shall continue more years than the king of the North. 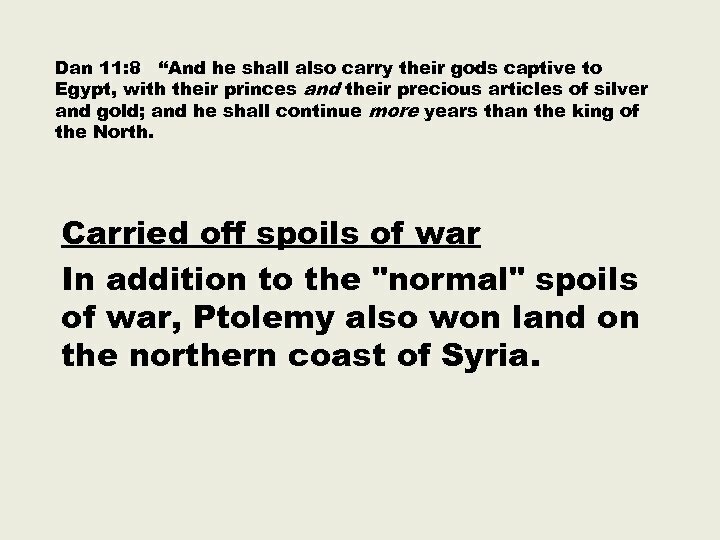 Carried off spoils of war In addition to the "normal" spoils of war, Ptolemy also won land on the northern coast of Syria. Dan 11: 10 “However his sons shall stir up strife, and assemble a multitude of great forces; and one shall certainly come and overwhelm and pass through; then he shall return to his fortress and stir up strife. 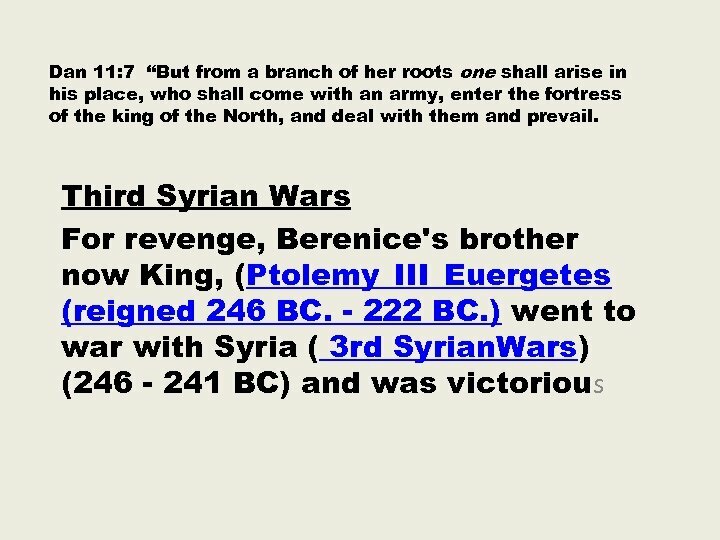 However, the sons of the King of the North will be more successful Antiochus III the Great attacked Egypt and captured their king (Ptolemy Philopater) (ruled 221 - 205 BC), and all winning most Syria in the Fourth Syrian War 219 - 217. Dan 11: 12 “When he has taken away the multitude, his heart will be lifted up; and he will cast down tens of thousands, but he will not prevail. The King of the South shall be victorious, but by immoral living he will not profit from those victories The King of the South could have followed up on his victory by making conquering all of Syria. However, he made peace with Antiochus. He was a wicked and selfish leader who also profaned the temple of God by entering the holy place. Therefore, even though he "cast down many ten thousands" he was not permanently "strengthened thereby"
Dan 11: 13 “For the king of the North will return and muster a multitude greater than the former, and shall certainly come at the end of some years with a great army and much equipment. 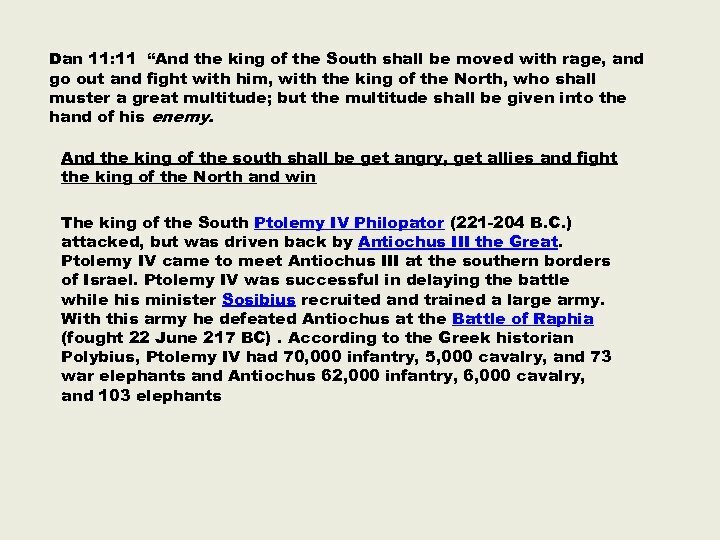 After a long time the King of the North will attack again After many years, Ptolemy_IV_Philopator died (204 BC) and his son and heir Ptolemy_V_Epiphanes was 5. He reigned 204 - 181 BC. Antiochus_III_the_Great took advantage of this situation and started the fifth Syrian wars by attacking with a very large force. Dan 11: 14 “Now in those times many shall rise up against the king of the South. Also, violent men of your people shall exalt themselves in fulfillment of the vision, but they shall fall. Dan 11: 15 “So the king of the North shall come and build a siege mound, and take a fortified city; and the forces [literary arms] of the South shall not withstand him. Even his choice troops shall have no strength to resist. 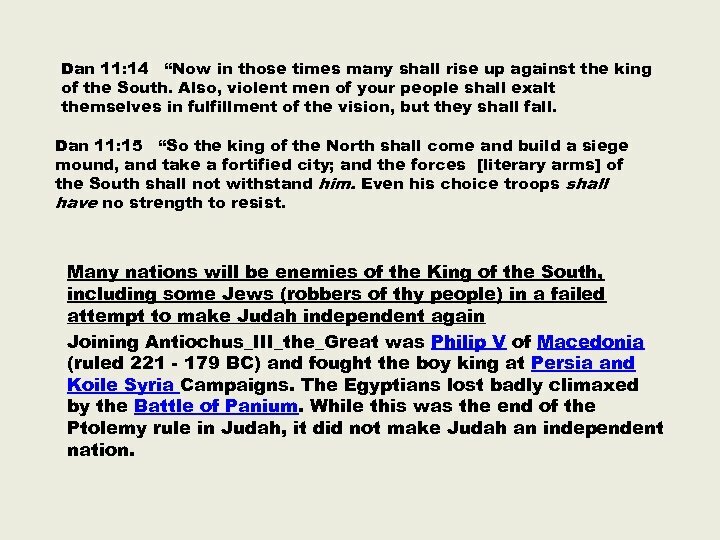 Many nations will be enemies of the King of the South, including some Jews (robbers of thy people) in a failed attempt to make Judah independent again Joining Antiochus_III_the_Great was Philip V of Macedonia (ruled 221 - 179 BC) and fought the boy king at Persia and Koile Syria Campaigns. The Egyptians lost badly climaxed by the Battle of Panium. While this was the end of the Ptolemy rule in Judah, it did not make Judah an independent nation. Dan 11: 16 “But he who comes against him shall do according to his own will, and no one shall stand against him. He shall stand in the Glorious Land with destruction in his power. [literary- hand] So the king of the north shall come again. By 199 Antiochus III had established a stronghold in Israel. He tried to bring peace between Egypt and Syria by giving his 10 year old daughter, Cleopatra I to marry 16 year old Ptolemy V Epiphanes of Egypt (193 BC. ), but the strategy didn't work. 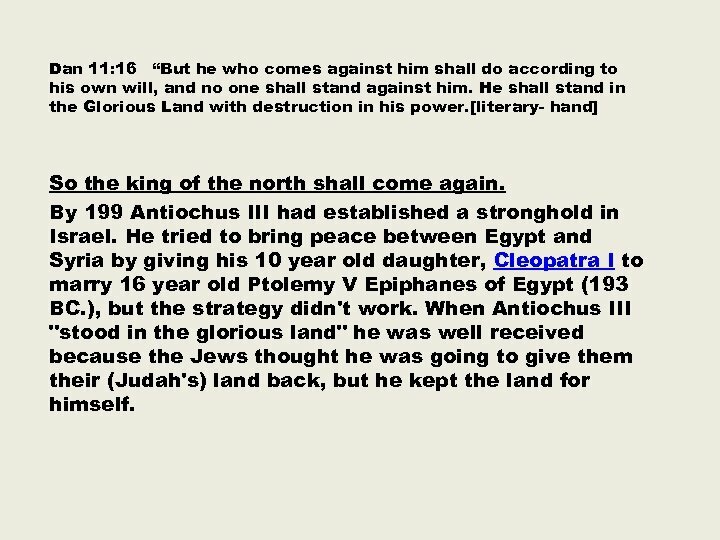 When Antiochus III "stood in the glorious land" he was well received because the Jews thought he was going to give them their (Judah's) land back, but he kept the land for himself. Dan 11: 17 “He shall also set his face to enter with the strength of his whole kingdom, and upright ones with him; thus shall he do. And he shall give him the daughter of women to destroy it; but she shall not stand with him, or be for him. Young Ptolemy V had entered into a treaty with Antiochus III after his military defeat in the Fifth Syrian War. Through this treaty, Antiochus III tried to strengthen his position and expand his empire even further. 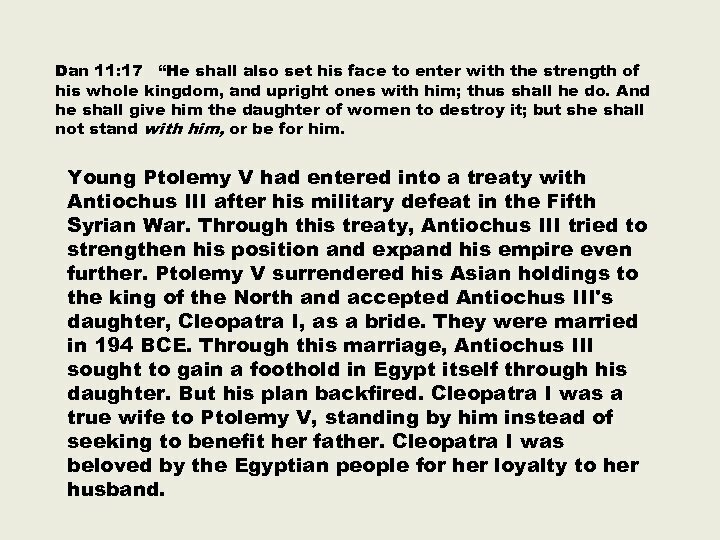 Ptolemy V surrendered his Asian holdings to the king of the North and accepted Antiochus III's daughter, Cleopatra I, as a bride. They were married in 194 BCE. Through this marriage, Antiochus III sought to gain a foothold in Egypt itself through his daughter. But his plan backfired. Cleopatra I was a true wife to Ptolemy V, standing by him instead of seeking to benefit her father. Cleopatra I was beloved by the Egyptian people for her loyalty to her husband. TENSES автор : Арефьева Светлана 08. 11.